Today’s guest blogger is Carole Tanenbaum, who wrote one of the foremost books on costume jewelry, “Fabulous Fakes.” For more about Carole, visit her website or check out her blog. When I first started collecting vintage costume jewelry, I was drawn to what I considered objects of art by Henry Schreiner. Based in New York City, he designed magnificent costume jewelry from the 1950s through the ’70s. His jewels catered to the stars and such couture houses as Dior and Balenciaga. These “gems” were produced in small runs and are coveted today by collectors and fashionistas the world over. What interests me about Schreiner Jewelry is its unusual construction, settings, and color combos. This brooch, for example, is two inches high. It consists of Schreiner’s signature inverted stone setting, in which the facets of crystals are shown rather than the flat surface. This enables light to catch these amazing stones. The hook-and-eye construction gives each layer structural integrity. And the color combination is daring, very “outside the box!” Schreiner also used the prong settings as part of the overall design, creating “fleur-de-lis” as well as large “tooth” prongs to hold the stones in place. The construction is an integral part of what makes Schreiner jewelry so special. There were few designers during that period who were as creative in both their design and construction. Schreiner was truly unique, a master of masterpieces! I have been interested for some time in the features that help distinguish the work of Schreiner from Countess Zoltowska (CIS) – as I believe that both produced unsigned work, both used tooth settings, inverted stones and unusual colour combinations and stones. I have been trying to examine characteristics that might allow us to distinguish each, as I believe some CIS pieces may be wrongly attributed to Schreiner. Also, I was wondering if you are aware of any connection between these two design houses. Do you ever use real stones in your work ??? And how do I found out the date of a PC ?. That is an amazing work of art, thank you for sharing your knowledge about Schreiner, I would love to own one of his pieces my self. How can you not love it? 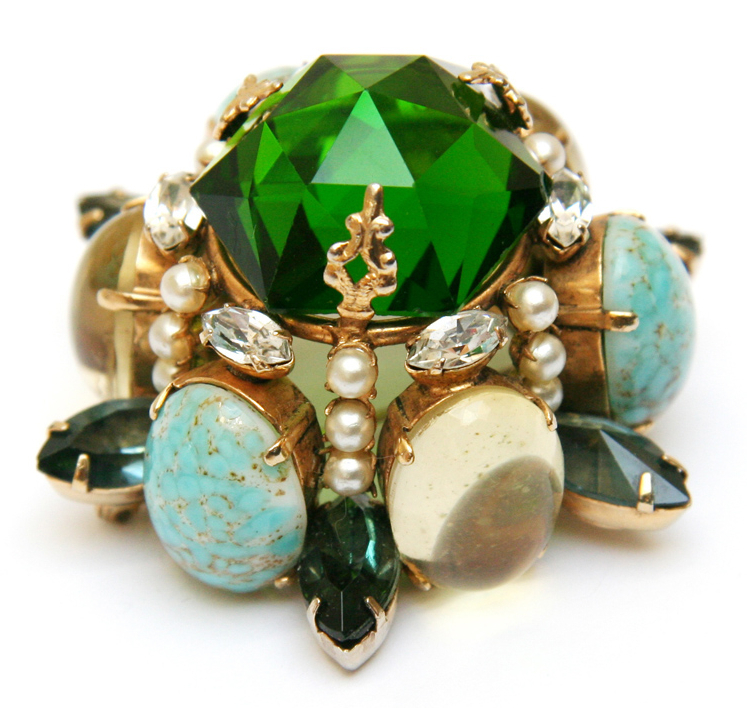 I have a beautiful signed Schreiner brooch set that is stunning! Can’t find anything like it only that is it of a mosaic hand painted style very large double domed brooch would love to see if it is something you’ve seen before and its history! Such an awesome piece! Are You Bold and Brassy Enough to Wear Vintage Napier Jewelry? “ ” What distinguished Baer from many other inventors was his attention to commercialization.